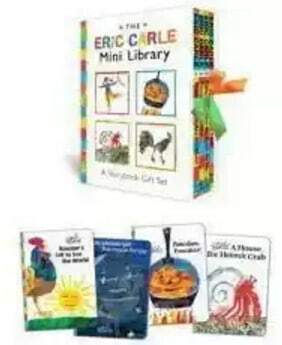 You can currently save 42% off The Eric Carle Mini Library: A Storybook Gift Set! Pay only $8.64 (reg $14.99). A great gift idea! This padded box set of Eric Carle's classic tales includes full-length mini editions of Rooster's Off to See the World, Papa Please Get Me the Moon, Pancakes Pancakes, and A House for Hermit Crab. Each mini-book slips into a sleeve bound into a padded cover featuring Carle's signature colors and patterns. The set ties together with two different brightly colored satin ribbons adding a whimsical touch to this sweet collection of stories.